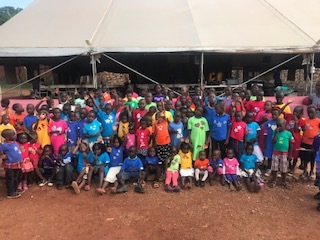 We pray this news update brings you joy as you read how your prayers and contributions have made it possible for vulnerable children to receive the news of God’s love. This January we went on a mission trip to Guatemala where we visited with Pastor Max and his staff at the church “Iglesia de la Verdad y La Vida”. Pastor Max is doing an amazing job of evangelizing remote areas of Guatemala, including areas where witchcraft is widely practiced. Their main focus is reaching children and families with the gospel. They were very happy to receive a donated M4KI library for their wonderful children’s ministry and work in the community. Another M4KI Library was donated to City House in Plano, Texas, a homeless shelter/transitional home for children and youth. We’ve been told that the children who come to the shelter arrive feeling lost, sad and lonely, and very worried about their future. City House was very thankful for the library, which they anticipate will give comfort and hope to these needy children and youth. We are currently updating and re-designing the M4KI website. We would appreciate your prayers that our website can adequately reflect the impact these libraries are already having. We want it to be a fun place to visit for updates on the the fruits of your faithful contributions and prayers! We are presently identifying more needy orphanages and organizations. If you serve or know of a ministry that serves vulnerable children, we would like to help by providing you with a Media Library free of charge. If you are able to help sponsor a Media Library, please visit the Donation Page on the website or you can send a check to the address below. Your help is greatly needed and appreciated.